I have written about Packing credit/Pre shipment credit, where in I have explained basic idea about Pre shipment Finance provided by bank. What is Pre shipment loan? Any advance or loans or any credit extended to exporters by bank for the purpose of manufacturing,procuring,processing or packing of goods before shipment can be called Pre-Shipment finance. 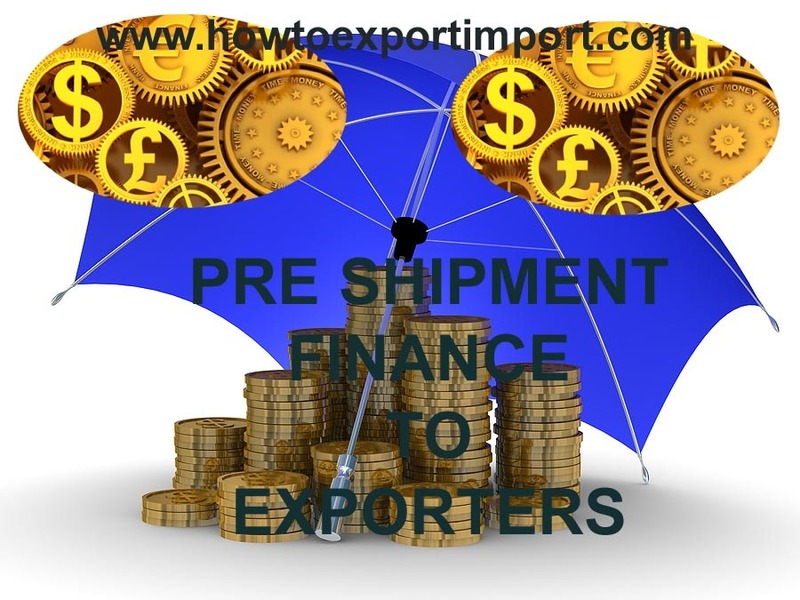 Pre shipment finance is also given as working capital expenses towards services on the basis of LC (letter of credit) in favor of exporter or in favor of some other person by overseas buyer or his behalf or any other evidence. 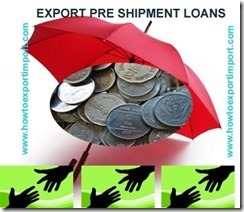 What is the period of Packing Credit/Pre shipment finance to exporters by bank? Normally, period of pre shipment finance is determined by the bank based on the circumstances of individual case. Each exporter requires pre shipment finance based on their nature of requirements such as time for procuring export goods, processing or manufacturing and shipping. 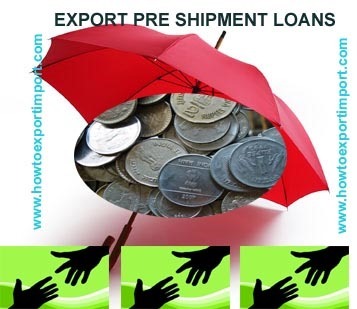 Once after obtaining Pre Shipment loan from bank, exporter submits necessary export documents with bank immediately up on each shipment takes place. Once overseas buyer paid exporter’s bill against export of goods, bank adjust such realized amount with the pre shipment loan already provided to exporter. What happens, if export bills not submitted after availing pre shipment finance? As per bank guidelines, exporter is required to submit export documents with bank after export takes place. If pre shipment advances are not adjusted by submission of export documents within 360 days from the date of advance, the advances will cease to qualify for prescribed rate of interest for export credit to the exporter. The commercial interest rate is charged from the date of disbursement of pre shipment finance. Refinance is provided by Reserve Bank for a maximum period of 180 days with permission. How does bank disburse Pre-Shipment Finance? Bank may release Pre Shipment Finance either in lump sum or in stages based on the requirements of exporter with satisfaction by bank against execution of export order. Bank maintains separate account for Packing Credit /Pre shipment finance to monitor the period of sanction of such pre shipment loan and end use of amount. The various stages of processing,manufacturing is monitored by bank by maintaining a separate account to ensure that the outstanding balance in accounts are adjusted by transfer from one account to the other and finally by proceeds of relative export documents on purchase, discount, etc. The major threat of bank is to monitor time to time on the progress of fulfillment of export orders by exporters. Exporters are required to update with bank on the changes or amendment in export orders on addition or deletion of export orders. How is packing credit/pre shipment finance be liquidated? Click here to go back to: Bank finance to exporters against Pre shipment and Post shipment. Related Read:How to find overseas (foreign) buyer? Click here to read Reserve Bank Circular about Pre shipment and Post Shipment Credit to Exporters. vivek CV: On 26 December 2014 Packing credit Loan can be availed in Foreign currency also. This facility is called as PCFC - Packing credit in Foreign currency. The Interest rate will be determined on the prevailing LIBOR rate. Availing packing credit in Foreign currency will be help to procure raw materials from the International market, for which the payment needs to be effected in Foreign Currency . as enterprises: On 13 February 2015 I had started business ( 4yrs. ago ) as Re-seller/Trader registered under State Sales Authority.There after I had obtained the IEC certificate for importing the Goods for re-sell in India.I had registered as "Merchant Exporter". I have also obtained Central excise registration as Dealer for passing on cenvat credit to my customer for imported goods.Recently in last two years I had made an export to kuwait country thrice.I got the order from overseas buyer for printing machine Spare parts.I got the materials purchased form several suppliers locally and export the same together under my firm name. The payment is against acceptance(on credit). I have not negotiated the documents thru. Bank and hence not submitted the documents to them but dealt directly.I have done it under free shipping bill. I got the payment but not as directed in my Invoice, that is by T/T or Swift But it was credited at "Treasury and International banking division" of my bank in Mumbai and transferred to my account electronically. I have two questions now: 1) Whether it is essential to submit the export documents like invoice, EC copy of shipping Bill to Bank, although I did export under free shipping bill and document dealt directly with customer on credit? 2) when I approach bank to submit the EC copy of Shipping Bill and invoice.They had refused to take the same telling that the payment received was not thru. the proper system and the bank is not involved in your transaction as you dealt directly. They advised to keep the EC copy of Shipping Bill with me. Admin: On 13 February 2015 Hello AS Enterprises, Your banker is right. Beacacuse your export payment transaction was not proper. You may contact a Chartered accountant or export import consultant to know more. suchit patil : On 08 July 2015 Myself and my friend we are planning to do export/import in partnership by establishing a partnership Firm....considering all aspects of export/import business which is better Proprietorship or Partnership? Which bank is the best bank for Export Finance in India. SaiKrishna Reddy Ch : On 08 July 2015 I choose to get into Export Import business because of my job profile, I am having an 7 years of experience in Trade finance in banking. I have been into letter of credits and have theoretical knowledge of Trade and currently I am working in a bank in Saudi Arabia. I am aware how the transactions happens through banks but I do not have an idea how it happens in realty like finding suppliers and buyers, choosing products to export/Import .I would like start a EXIM business and need your guidance to step forward. sumathi: On 09 July 2015 Are there any incentives or subsidies for export of agricultural products?? ayaz kazi: On 25 February 2016 Sir i had got the purchase order and want the pre shipment loan from bank so what documents & procedure i had to follow. Rajesh: On 04 April 2016 I have received a purchase order along with at sight LC & the expiry date is 30-08-2016 value of US$ 45000.00. So I need to know, I do'nt have capital to complete the order & I want Finance. I Just have current account in Bank. Can I avail the same & Please send me procedure to start that. Regards Rajesh. Manoj Kumar : On 09 August 2016 I am Manoj, working as Manager in a Scheduled Bank at Bangalore. I am interested to learn more about Trade Finance and incidentally, came to know about your expetise in the area. May I get an opportunity to meet you in person, at your convenience. Looking forward to hear from you. shoyeb khan : On 20 November 2016 My question is, 1).if exporter send goods from foreign country and after bill due date buyer do not pay payment at that what we should do? 2).which payment term best and secure for freshers or beginners in this field. 3).an exporters bank how much pay amount of good when buyer do not send money? Danish Raza : On 22 April 2017 sir I am new in export business and I have need for finance in case of my export order(LC). I don't have much more knowledge about the export financial support, but on internet I saw Indian government helping to the exporter to increase export business with help of preshipment credit and post shipment credit. but I donot know how can I get this facility. for this purpose my concern bank is Axis bank ltd in Nagpur, and I asked them about preshipment credit, then they told me sorry we can not give you, coz for this we need 3 years balance sheet along with some property security, and he given me example suppose if your property value is 1cr then in this case we can give you 60-65% credit. sir as I told you I am very new in export business I don't have 3 year balance sheet neither have property, then how can I fulfill the bank demand, Dear sir please help me how can I get finance in case of my export order? I have so many customers but do not have much more capital. how government supporting to the new exporter? Dear sir please help me and solve my problem.